For over 50 years, Krylon® has been making superior-quality; innovative aerosol and small can project paints and artist sprays. 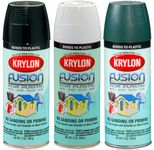 Krylon are the leaders in product innovation, with a proven track record of creating new and exciting products and programs that inspire new possibilities in spray painting and decorating. Krylon Paint can only be delivered via UPS Ground Shipping (not 2nd day air); and therefore, can only be shipped within the 48 Continental US.